So, for this week’s spread I used the free printables I got from Vintage Glam Studio.I used the Planner Quote stickers.Her stickers are so pretty and i suggest you check them out! I don’t have an ECLP yet, so I use these stickers and adjust the size to fit the dimensions of my Teneues planner. I wrote everything I want to get done on the weekly day page. On the notes page I wrote down longer sentences and mostly things I have to get done for work (teacher) and my blog post ideas. I always check what I wrote down in my previous week’s spread and if I didn’t do something, I move it to the next week spread. This week’s main goal is to ride my stationary bike as much as possible and catch up on my reading. I also have a lot of research to do cause I am going to a conference in November and need to find articles to support the points I will be making during my presentation. DIY stickers are a great affordable solution and the Vintage Glam studio has loads of spreads to download. Cutting the stickers is a bit hard but luckily I am not a perfectionist so if something is a bit crooked that ois OK. I also used 3D stickers and happy faces. How do you plan? Do you want to write a guest blog post and share your planner habits? Let me know in the comments section below. Maybe I would use my diary more if it was as colourful as yours! 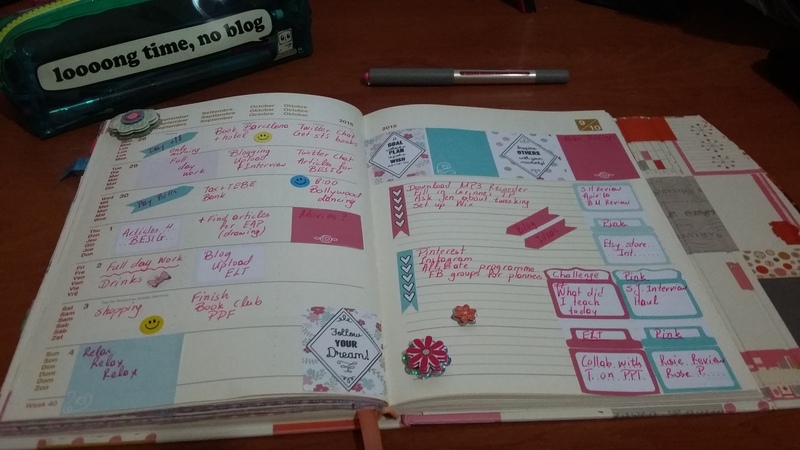 I never considered a colourful diary and the use of stickers until reading this post so thank you for an idea of what kind of diary I will be getting in 2016!